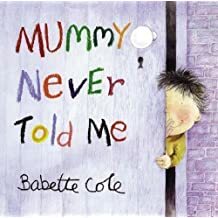 Mummy Never Told Me (2003) was written and illustrate by the prolific Babette Cole and published in the UK by Jonathon Cape. The story and illustrations are outrageous but oddly charming like much of Cole’s work. This narrative is told from the point-of-view of a curious little boy who realizes life is full of mystery and his mummy has been keeping secrets. Text and images pair well and follow a predictable format. The boy asks a question that stretches across a two-page spread. The first image depicts him clearly pondering the topic and the second is a silly and surprising illustrated answer. For instance, in one two-page spread he asks: “what is my tummy button for…”. The whimsical illustrations paired with the text depict him touching his “tummy button.” On the facing page, his naked mother has just given birth and a doctor holds the baby away from her body to emphasize the umbilical cord. Other awkward content includes the boy’s parents jumping naked on their bed and an image of them skinny dipping while out on a date. Although LGBTQ content is touched on, it is minimal. Some women fall in love with women and some men with men. The narrator is sure he will figure it out one day. The campy book seems to barely acknowledge its primary audience. Although quite funny, I can only see giving it tongue-in-cheek as a shower gift you never expect your expecting pal to read to her child.